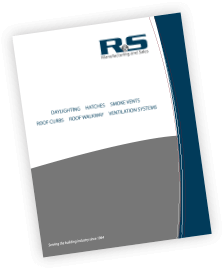 R&S Unit Skylights are designed and constructed to fit both metal building and built-up roofs. When a curb is included with your order, flanges are customized to fit any metal building roof profile, or the unit can be equipped with flat perimeter flanges for conventional built-up roof systems. OHSA Compliant Fall Protection can be added as well.